Millions of Dollars of Hot Tubs, Swim Spas, and everything must go!!! Our events normally run Friday-Sunday. They are held in-doors in climate controlled comfort. Don't miss this opportunity to save thousands. All of our events offer free admission and most have free parking. Why pay to shop, come to one of our events for free. We have over a 100 Hot Tubs and Swim Spas on display and everything must go. We price them to move. Come see for yourself. We offer on-site, 18-month interest free financing (to qualified buyers). Have an old, inefficient working or non-working Hot Tub we will take it on trade or haul it away. All our Hot Tubs and Swim Spas come with free delivery. We'll deliver to your home, cabin or anywhere in the USA. Enjoy the therapeutic benefits of owning your own spa. Who can’t use some stress relief? 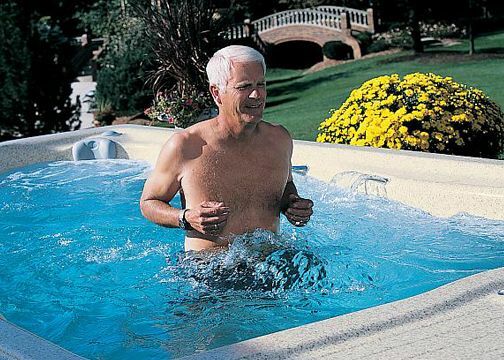 A hot tub also alleviates muscle and Arthritis pain as well as insomnia. 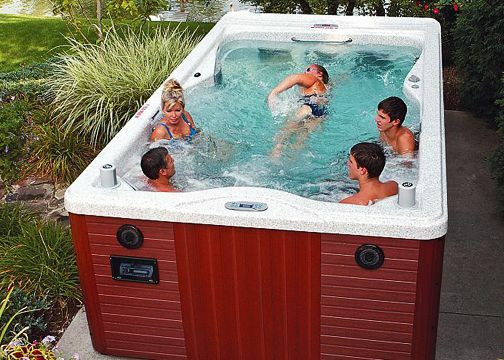 We have many models to choose from so you are sure to find the hot tub thats right for you. We'll even haul away your old hot tub. 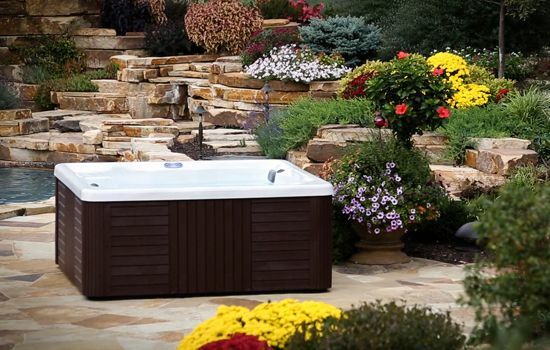 We have the hot tub for any budget, come in and see for yourself. You get the massaging hot water jets and all the enjoyment that a spa can offer in a unit that also includes a swimming area. Water provides buoyancy to reduce impact while enhancing flexibility, strength and balance. Unlike a traditional pool, a swim spa can be used year round in any climate. A Swim Spa provides a safe, convenient and personal enviroment for swimmers of all skill levels. Millions of dollars of inventory must be sold! You get the massaging hot water jets and all the enjoyment that a spa can offer in a unit that also includes a swimming area. The only difference is that this is much more compact than a traditional in-ground pool with a separate area for a hot tub or spa. Although the swim spa is designed differently than a traditional swimming pool, it is still large enough to fit a number of people and to allow the same kind of fun enjoyed in traditional swimming pools. Again, the main difference is the depth of the water and a smaller pool area. Pools are out of the question for some people because they don’t have sufficient space in their backyards. Swim spas may be the answer because they don’t take up nearly the size of a traditional swimming pool. Swim spas are more like spas or fiberglass swimming pools, so if they are going in-ground, the installation is fairly quick and easy. However, they also come in above ground models that make the installation even simpler. Perhaps the most popular reason to get a swim spa is to enjoy the ability to swim laps without worrying about turns or paying for big pools. Water jets that can be adjusted for various speeds pushing out against the swimmer, keeping them in place, as they swim against the current. With the jets off, the swim spa can also be used for other water-based exercises. Spas are great for relaxing and easing muscle tensions and aches, particularly after exercise. With the swim spa, you can go almost immediately from your water workout into the massaging waters of the spa. No driving to a gym of pool its right in you own backyard. Swim spas that are not in-ground units have the advantage of being mobile, meaning they can move when you move. While there’s a certain benefit to adding a little to the price of your home because of the swimming pool, it’s also nice to start with a swim spa in your new home. Because the swim spas are portable, they can be located indoors or outdoors. If your home has an indoor location for a swim spa, you can enjoy the unit even on stormy or snowy days. A swim spa that may have been meant for the swimmer in the family is likely to encourage others to try out the benefits of easy, lap swimming. The jets that provide resistance that can be adjusted for beginner swimmers or for much more capable swimmers. Compared to a traditional swimming pool, the maintenance for a swim spa is much easier because it is smaller and uses fewer chemicals. Also, the fiberglass or acrylic construction produces a smooth surface that minimizes the production of algae. A swim spa provides the benefits of a swimming pool in a compact package. It produces a current that users can swim against and provides plenty of room for aquatic exercise; some even allow for deep-water running or exercising while keeping the swimmer completely buoyant. 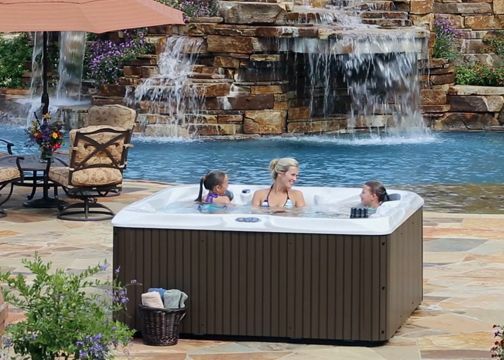 Many swim spa models also offer hydrotherapy seating and jets, combining attributes of a hot tub and pool in one convenient unit, so you can experience a soothing massage after your aquatic workout, or a friend or family member can enjoy hydrotherapy while you exercise. It's time to make a big splash this summer — for your health. The United States Census Bureau reports that during 2009, there were 301 million swimming visits each year by Americans who were over the age of six. Swimming — ranked as the fourth most popular sports-based activity in the nation — can reduce the incidence of chronic illnesses with just two and a half hours a week, says the U.S. Department of Health and Human Services. Water aerobics is easy on the joints and can even increase muscle strength and endurance due to the water's built-in resistance. This form of exercise is preferred by many as opposed to a more traditional form of fitness, like hitting the gym, because the weight doesn't pull the person down the same way a regular workout would. Therefore, a person can exercise longer on water than on land without the extra effort or the joint and muscle pain that often accompanies a regular exercise routine because of its low impact. Syd Hoffman , health and wellness educator in Phoenix, Ariz. and author of All-Day Energy: 100 Ways to Boost Your Energy...Now! told Medical Daily that water walking and water aerobics is "75 percent gentler on their joints," referring to people with inflammation and/or who are overweight. There is no delay of muscle soreness after a workout, which makes it a go-to activity for those looking for a low-impact aerobic workout. Joint range of motion and muscle function is increased during water fitness without having a negative impact on those who participate in it and have chronic diseases. In a study published in the journal The Cochrane Library, researchers reviewed six studies involving 800 patients to compare the effectiveness and safety of aquatic-exercise methods to treat knee and hip osteoarthritis (OA). The results of the study showed that water aerobics have some short-term benefits for patients with knee and hip OA, and should be done as the first part of a longer exercise regimen for those with OA. Water-based activities are beneficial to those who suffer from inflammatory diseases due to the hydrostatic pressure, which aids aching joints. Janna Lowell, personal fitness trainer in Los Angeles, CA and author of Noodles For Dumbbells - Water Exercise, Weight Management & More said to Medical Daily that she believes the hydrostatic pressure helps alleviate painful joints as it "causes stagnant fluid build-up to disappear while keeping the heart rate 13-17 points lower than it would be on land with the same level of intensity." The impact of aquatic exercises on the heart rate can be a great form of exercise for individuals who suffer from heart complications. Water aerobics can help improve the physical and mental health of an individual. The environment can help you relieve stress and tension as the muscles are loosened once you let your body submerge in water. The little to no impact on joints and muscles helps you strengthen the body and lose weight; a person who weighs 150 lbs. can burn 272 calories in one hour — sweat free! After my hip replacement I exercised every day in my swim spa and recovered in half the time. my doctor was amazed." I swim for 20 minutes every day in my new Swim Spa. I've never been healthier." Our entire family enjoys spending quality time in our new SPA." The prices were unheard of and the sales people were friendly and knowledgeable." If you wish to contact us using the form below we will respond within 24hrs. © Copyright Spa Pool and BBQ Show 2017. All Rights Reserved.